Real GDP growth now requires less energy but is that the point? Regular readers will know that I am pro-growth – economic growth that is. I get criticised for saying that by Greens and such because they only consider GDP growth within their own economic paradigm, which is tainted, if only subconsciously, by neo-liberal conceptions of enterprise and employment. I would say that I am as Green as anyone but also understand that being engaged in employment is a basic human endeavour. I also agree that our usual conceptions of gainful employment – working for a capitalist to make them profits – will typically not place the ‘greenness’ of the jobs as a priority, and will, in many cases involved environmentally destructive resource use. The key to disengaging growing employment and hence, economic growth, from activities that are environmentally destructive is to redefine what we mean by productive and useful employment. But, there is also evidence that within the mainstream world of markets, private firms are starting to disengage the link between energy use and economic growth. But will that be enough? This blog is just sketching my own catchup on the latest energy use data. You might find it interesting. For centuries, the rise of GDP has gone hand-in-hand with the burning of fossil fuels. But technology has now broken that link. The analysis is UK-centric and the aim of the article is to convince us that markets are working to allay our fears that our use of fossil fuels will destroy us and that economic growth in to be discouraged. The writer, a former British Parliamentarian (Liberal Democrats) who served time in prison for lying about driving offenses, notes that “For the first time in history, we are growing richer while using less energy”. … inextricably linked to the burning of fossil fuels, and therefore to the beginning of carbon emissions and global warming. And we are paying with the steady rise in carbon and temperatures compared with pre-industrial levels. Which is one of the principle reasons why Green groups etc oppose the concept of economic growth as measured. … the two-century link between growth and energy has broken. The UK economy has doubled in real terms since 1985, but total energy consumption is exactly the same as it was in that year. Indeed, energy consumption has fallen since 1970 while the economy has nearly trebled in size. The graph he is referring to for the UK comes from the British Department of Energy and Climate Change released the 2014 version of the – Digest of United Kingdom energy statistics – which provides a detailed account of energy use in the UK and released the latest data on July 31, 2014. Particularly interesting was the chapter on – Long term trends – which happened to provide the graph in question (Page 196, Chart 1.1.5 Energy ratio since 1970). 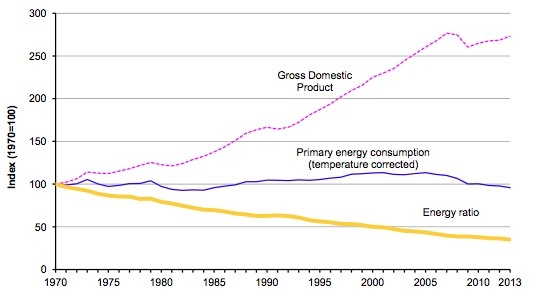 The graph shows real GDP (indexed to 100 in 1970), the United Kingdom’s temperature corrected inland primary energy consumption and the measure called the energy ratio (the total energy consumption divided by GDP), which is “expressed … as energy consumed per million pound of GDP”. The data also shows that the UK has gone from a Fossil fuel dependency (share of total energy consumption) share of 96.5 per cent in 1970 to 86.2 per cent in 2013. It is unclear where he gets his figures from. The data provided by the US Energy Information Administration – International Energy Statistics – suggests that the Global ratio has fallen by some 14 per cent since 1990, which is some way from 35 per cent. The following graph shows the percentage decline in the Energy per dollar of GDP (that is, the energy ratio) between 1980 and 2011. So it is true that we are now producing more material output with less energy but the decline is still fairly slow on a world scale. The rise in Asia-Oceania at the same time that China and Japan are declining is due to Thailand and Indonesia. The next graph shows that things are so not favourable when we take into account population growth. 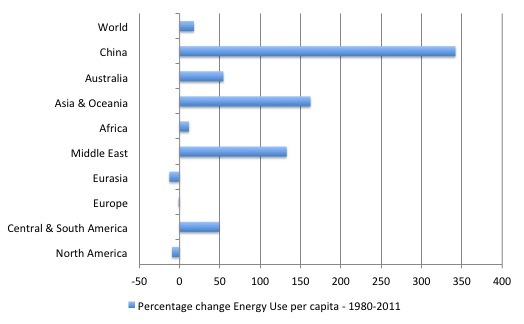 It shows the Energy use on a per capita basis from 1980 to 2011. 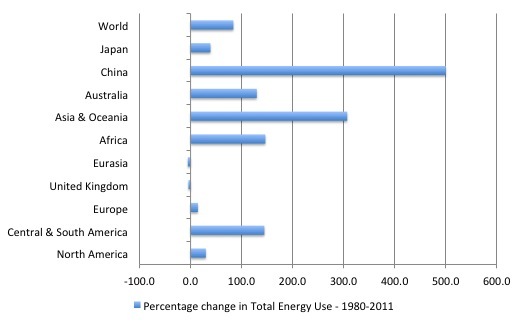 Each citizen in the World (on average) has increased their use of Energy by 17 per cent. This has two dimensions. First, poorer nations are growing and gaining increased incomes which allow them to use more electricity and petrol. Without knowing the distribution of energy use within the specific nations concerned, we cannot conclude that this is necessarily and increase in equity. Clearly rising middle classes are emerging in China, India and parts of Africa. Second, for nations such as Australia, which are already among the wealthiest the substantial rise in energy per person is a troubling trend and counter to what is going on in Europe and North America. 2. “We are also taking the train more”. 3. “Nearly two-thirds of our energy bills go on homeheating, and our boilers are better and homes more insulated”. 4. “Our household items use much less electricity than before”. 5. “The cost of lighting is collapsing”. All of which is being observed in most advanced nations. The article considers that part of this “is a response to the marketplace”, that is, the substitution of lower cost sources of energy for higher cost energy. That is microeconomics 101. He also considers that “Government policy has also helped” – regulation, vehicle emission standards etc. In this vein, he urges governments to “encourage household energy saving” by assisting poorer households who “simply cannot afford the up-front cost” of the new technologies. The current Federal government in Australia is cutting assistance to poor households to help them make transitions to low energy use. Foresight is not one of their strengths. They are following the UK government which cut the so-called “Eco subsidy”. The data from the US Energy Information Administration helps us put the trends in the advanced nations into some perspective. Comparisons against real GDP are not necessarily what matters in a world that has finite resources and the pace of substitution away from finite to renewable is not guaranteed to be quick enough to avoid the scarcity or the irreversible environmental damage. The fact is that total energy use is still rising at a fairly rapid rate. 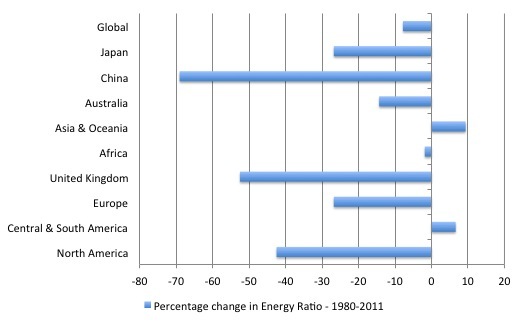 The following graph shows the growth in energy consumption between 1980 and 2011 for the major geographical blocks plus a few individual nations. In 1980, North America used 5.2 times more energy than China but by 2011, the ratio had fallen to 1.1 times as China has increased its energy usage by 500 per cent and North America by only 29.9 per cent. 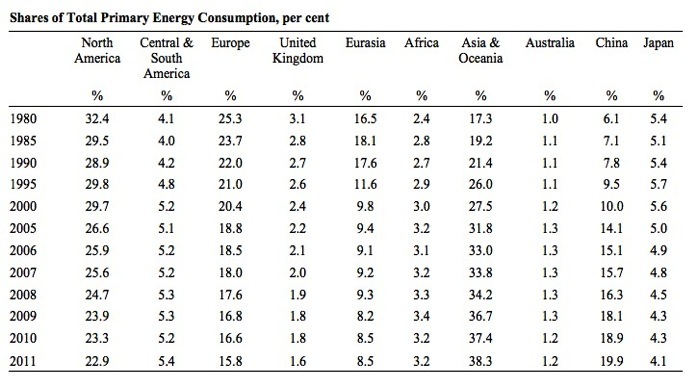 To put those changes into perspective, the following Table shows the shares in total World primary energy consumption. The data comes from the US Energy Information Administration. 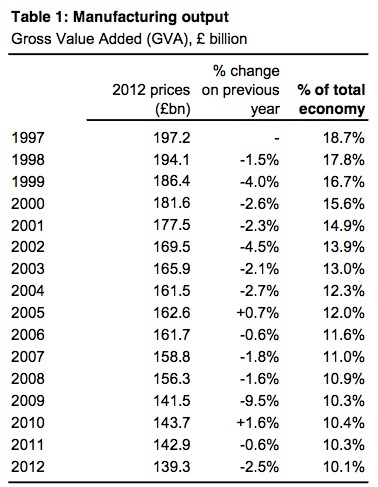 There has been a dramatic change in the shares with China becoming more than 3 times as large as it was in 1980. Bad policy, and Treasury short-termism, is a crying shame (if nothing new). But the big picture is clear, and optimistic. Energy-saving is working. Green growth makes sense, and is happening. There is a future that preserves the gains of industrialisation without its polluting losses. Our living standards are rising, while our energy use is not. Which applies to the UK but not the World as a whole. Britain’s share of total energy consumption is miniscule. The deindustrialisation of the advanced nations has shifted the energy use to the newly industrial nations. While they are also producing GDP growth with less energy, their rapidly growing populations are using much more energy than in the past. I have no idea of what the limits are but having had a tooth die over the last weekend (with great pain) I know that biological systems die without warning. That suggests a very risk averse strategy should be adopted by policy makers. The old adage propagated by economists that as a nation becomes richer (with more real GDP growth) it can better afford to pay for pollution alleviation fails to recognise that limits can be reached before we know the boundary has been crossed. We might be using energy more efficiently (when considered in terms of producing real GDP) but that doesn’t tell us anything about when a certain level of energy use is too much. I’ve also been frustrated by the “anti-growth” crowd, especially because they have no answer to their vision of human survival in anything but a dismal world. As for myself, I keep thinking of all of that street art we see painted up the sides of older buildings, putting an exciting face on what is often otherwise seen as slum properties. How easily we could pay local people through a job guarantee to do things like that. Now obviously we need more than that, but I try to tell these folks that’s how they need to start thinking. Then they get all caught up in the money = inflation paradigm, and that’s all she wrote. I found this very interesting. I happen to be an optimist on this, thinking that technology will save us. I hope I am not being naive here. There is a lot of interesting R&D going on right now in fascinating technology like 4th Gen Nuclear Fission and cheap Nuclear Fusion. If there is a break through here and we should know soon enough, (Lockheed Martin is predicting a 5 year development timeline for a compact fusion reactor design), and they happen to be cheaper then coal which appears likely. Then I do not see whether it matters whether the energy intensity improves. As long as the Carbon intensity improves. I am not so sure about this statement. The UK via its London operations has forced all of Europe to enage in manic import and export trade practices. The true energy cost of such operations is huge. This can be most clearly seen in Spain post 1959 where many millions of UK residents / tourists burn energy outside the UKs Geographical area yet UK resident banks force Spain into physical surplus despite the presence of many millions of tourists on its soil. I am reminded of CH Douglas comments on Sweden during the second world war where he stated it was forced to work 3 times harder then necessary so as to survive. Sweden exported most of its iron ore for the German war machine during this time. The UK is nothing more then a neo liberal war economy where new tank consumption….sorry new car consumption is running at 1.287 million units in the first half of the year , up 10.6% from a already booming Y2013 first half. What is the true energy cost of shipping fresh fruit from Spain to London. On what national energy balance sheet does this show up ? Who bears the cost of this ? The Uks goods trade deficit with the rest of the world is likley to top 110 billion Sterling this year , most of this is within the new commonwealth of Euroland. The real reason for Spanish Austerity. A loss of Russian markets means the UK can buy its stuff at a lower price. This is a incorrect statement and is often used in reference to the UK. People in the UK do not live a agrarian lifesyle centered on the village. The only difference is that their hinterland has expanded beyond the national sphere. One does not need a economic degree to understand this. Watching Emmerdale Farm (A UK soap) as its change of lifesyle and setting became more racy over the years is enough me thinks. Quite frankly, I give you more latitude here than you deserve. You often post rather lateral comments which I permit in the interests of broad thinking. Quite often you post quite vituperative comments that might be interpreted personally. But I am sick of your ill-informed statements masquerading as expertise. De-industrialisation has a specific meaning in the literature that I am sure you haven’t read nor considered. 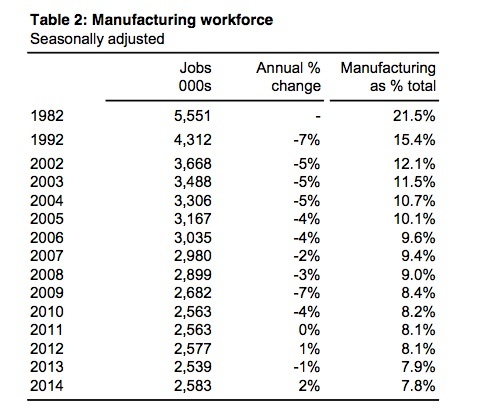 Here are two tables drawn from an official document (and statistics) – http://www.parliament.uk/Templates/BriefingPapers/Pages/BPPdfDownload.aspx?bp-id=sn01942 – which substantiate the claim that Britain has undergone a radical de-industrialisation. From now on I will be more careful what I approve from you. Perhaps you should broaden your knowledge base beyond the soap opera you cite. @Benedict@Large It’s not because of some conspiracy from the power companies. The existing grid is not cut out for this kind of load. Whether you like it or not, nuclear is going to play a big part in future energy needs. The problem is, advancement in the technological side of things is severely hampered by Monetarist style policies. You cite local production of goods. We no longer live in city or nation states. We live in a global market state much like the 19th century. The people of the UK consume a vast amount of Industrial products = therefore they are industrial in my little book just as a people who consume bush game are hunter gatherers whether they hunt or scavange from others. The object of the game is not to produce but to consume. A ship lost in the battle of the Atlantic not produced in the Uk did not show up on the UK energy balance in any way but was used nevertheless. A loss of oil imports such as what happened in 1942 did show up on its balance. Why do you have a problem with this clear logic ? You want a war economy yet do not declare its true costs on general humanity. Let me make a few brief comments. 1 – The richer a country is, the less economic growth it needs. Bangladesh needs economic growth more than Australia does. What matters is the per capita level of output, not its rate of growth. What matters is speed, not acceleration. Acceleration is only a means to attain a desired speed. Per capita income is the speed and per capita economic growth is the acceleration. 2 – Energy efficiency can’t be increased continuously. It is highly unlikely that we will be able to make cars in the future that can get 100 kms out of one liter. The important thing therefore is to find sources of energy that are both renewable and not damaging to the environment or the climate. 3 – Nothing can go on forever, and that should include economic growth. Suppose that per capita income in Italy had been 1000 dollars 2000 years ago and that it had increased at the slow rate of 0.7% per year. It would then have doubled every century, so that would have been 20 doublings. This means that per capita income in Italy today would be 1,048,576 times higher than 2000 years ago, so it would be 1,048,576,000, more than a billion for each man, woman and child in Italy. Is that possible? I don’t think so. bill, i find your insights very interesting and thanks for doing that. I have a question about growth. Why is it so important for full employment? Because of workforce growth or there is some other reason? The connection between energy use and economic production can be “stretched” but it cannot be broken. By “stretched” I mean increases in the efficiency of production. This involves an increase in the production count or value of production per unit of energy applied as useful work. However, the link between production and energy use cannot be broken entirely as to do so would be to create a perpetual motion machine. This absolutely cannot occur within our current understanding and formulation of physical laws especially thermodynamics. I think all scientifically literate people will understand that the economy cannot become a perpetual motion machine. Exergy is energy available for useful work. Exergy availability is only one of the factors with the real potential to limit the modern world economy and prevent it growing much further, at least in quantitative terms. Qualitative growth can occur for much longer but not theoretically forever as even qualitative growth will hit limits. Even qualitative growth requires an increase in order (a decrease in entropy) and this always requires energy inputs to generate and maintain the higher levels of order. As well as exergy availability we have to be concerned about material availability and quality (e.g. fresh water or the quality of mineral ores) and about the heat and waste sinks of the environment. With regard to waste heat and other wastes from our economy we largely rely on the physical services and bioservices of the biosphere and its natural cycles. The concept of stocks and flows (so useful to macroeconomics) is also useful in considering sustainability. Fossil fuels are a stock. They are created at a very slow rate, typically over hundreds of millions of years, and only during certain epochs, thus on any civilisational scale we have to regard them as a stock. But this stock turns out to have other limits apart from being a limited stock. There are flow limits to how fast the stock can be drawn down. Oil wells only flow so fast naturally, if they flow naturally at all, and injecting CO2 or seawater can increase flow but only to a degree. Sometimes forcing a field to produce too fast can damage the underground reservoir and reduce total production in the long run. All fossil fuels considered together (oil, coal, natural gas, bituminous fields, methane clathrates) present us with another limit. If they were all burned they would “cook” our climate due to CO2 emissions. The amounts of methane are massive and if we destabilise tundra methane and ocean bed methane clathrates this will certainly wipe out homo sapiens. Fresh water also presents us with the reality of stocks and flows both being important. The world’s fresh water stocks (lakes, dams and aquifers or so-called “fossil water”) are being depleted much faster than the flow of natural replenishment. When we have depleted the natural stocks in certain regions we will have to survive on natural flows or perhaps desalinate at a high exergy cost. Much is often made of substitution. Copper has become relatively scarce and expensive but we now use aluminium with iron cores for high voltage cables. We now use silicon (as glass) for fibreoptic data cables. However, water in biological systems (including in the human body) is non-substitutable. This indicates that fresh water availability will always be a serious limiting factor to human activity including economic activity (which presupposes active, healthy humans as directing agents). All the scientific evidence in the fields of systems analysis (Club of Rome:Limits to Growth), biophysical economics, climate science (IPCC), Global Footprint Analysis and many general statements from the Union of Concerned Scientists indicate that we have not merely reached the limits to growth, we have overshot the globe’s capacity to support us in our current numbers at our current living standard(s). A special kind of program is now the only feasible way to salvage our future. This program would have to involve both growth and de-growth in different sectors. First, to bite the bullet, we must end population growth and either stabilise it or reduce it. We must reduce internal combustion engines, coal power stations, natural gas use and even nuclear power stations. We must massively reduce military spending and military hardware which are a huge and destructive waste of resources. (1) Solar and wind power. (2) Service industries (health, education, welfare, human services). (3) Pure and applied research in all fields except military applications. (8) Re-vegetation and re-foresting programs. The above could be done with stimulatory spending and the job guarantee. The program would be to move from quantitative growth to qualitative growth. Indeed quantitative de-growth could occur simultaneously with qualitative growth at a net increase to employment until full employment is achieved. As an example:- We could progressively phase out internal combustion engine automobiles and phase in a combination of smaller and less electric cars plus much improved public transit. Due to both economies of scaling up (mass transit) and economies of scaling down (less cars, smaller cars for single person journeys) the result would de-growth in quantities of infrastructure and fleet but great growth in quality of built environment, natural environment and genuine amenity. Increased staffing of the mass transit system would be provided; drivers kept alert with short shifts, conductors and well trained, well behaved security staff added and staff added at stations with the clear committment that you can always use automated services or human services (ticketing etc.) as you wish. That’s just one example. Its often good to look at some of the hardest problems to see improvements in energy efficiency. (something that could almost be used as a counter example argument). All of the above are pretty hard to improve efficiency as the chemistry behind such things requires a lot of energy. *Recycling steel (~15% of all coal dug out of the ground is used to make steel and only ~33% of it is recycled after use. Yes steel can be recycled infinitely). A technology that should be improved, i remember reading that the advantages of using the sun is the chemical reactions for manufacturing raw materials leaves less impurities than a lot of conventional processes. *Direct Reduced Iron process for manufacturing steel. Using biomass to create charcoal from carbon neutral biomass (willow trees which can be grown quickly on degraded land). *Dont use titanium except where its strength is needed. Note to everyone: NEVER ever buy a computer (like a macbook pro titanium), phone, kitchen appliance with titanium components. That is the most insanely ridiculous way to waste energy/massive environmental footprint on something which will be obsolete/break and hard to recycle. A little strange as i though combustion engines with cylinders and engine block were always around 75% efficient then throw in gears and friction etc. Point being all this if anything reinforces Bills observations. And it would be nice to see some good ‘fiscal’ policy from governments to assist moreso! Environmentalism + growth is not a contradiction in fact or aspirations. sam, I’m puzzled as to why you thought internal combustion engines were around 75% efficient. Is it just because you once heard someone make that erroneous claim? I don’t think Macbook Pros have ever been made of titanium. They’re aluminium. The titanium powerbooks have long been out of production. I did once buy one (second hand) thinking the titanium would have significant scrap value, but when I discovered it was difficult to recycle I didn’t investigate further. Aluminium from bauxite is very energy intensive, but that’s not the problem. The problem is that it’s being done with electricity from coal. Switching production to 100% renewables is something that should be done ASAP. Steelmaking could become much more efficient with molten oxide electrolysis, though the technology’s in its infancy and will take years (possibly decades) to commercialise. This technique may revolutionize titanium production too. Even qualitative growth requires an increase in order (a decrease in entropy) and this always requires energy inputs to generate and maintain the higher levels of order. We have the sun doing that, so your concern is baseless. In reality, if population growth continues, we will most probably eventually be in some environmental crisis or another even if we stop using fossil fuels for energy. With a stable population we can absolutely make do with the resources we have at present if we continually learn to extract better uses from them and switch to energy alternatives. Getting something new and more valuable out of something old and tired is growth for a stable population. If it’s true that population growth tends to decline as nations become more developed we may be headed this way now although at a snails pace. A truly virtuous circle does involve full employment where labor always gets back everything it gives. Labor augmented only by the presently available alternatives: solar, wind etc.. could become a far more valuable commodity than it is at present especially if it has the skills to maximize the returns from the more modest yet otherwise free inputs provided by nature. Ikonoclast, I agree with 99% of what you have written.However,we need an increase in nuclear electricity generation,not a reduction. Nuclear fission is the only proven,reliable 24/7,non-polluting energy source we have readily available now,or likely to have in the foreseeable future. Current nuclear technology has worked for over 50 years and is constantly being improved. Renewables have niche applications only. They can’t provide the energy needed to ameliorate the coming systems collapse. Please research nuclear history and technology thoroughly before adopting a biased contra position. Podargus, we have nuclear fission available now? Where? Proven? In what sense? I have researched nuclear power as an educated layperson but not as a nuclear scientist. I have an Arts/Science degree taken about 40 years ago but no subjects in nuclear physics. My personal research has convinced me that nuclear fission power has limits and these limits are also near. This is true while breeder reactors are not a significant part of the mix. I will come back to breeder reactors later. A little known fact is that the highest peak of uranium production to date, about 65,000 tonnes U per annum, occured about 1979-1980. Production declined significantly over the 1980s, flatlined at about half that level through the 1990s and has been climbing again since. During the flatline period, the decommisioning of nuclear warheads and the fissioning of that fuel made up the shortfall. World civil plus naval reactor demand went to a little over 70,000 tonnes U per annum and has more or less flatlined at that level ever since. Uranium production is now increasing again with Kazakhstan the new main “swing” supplier. Production in 2012 was 58,394 tonnes U. The uranium supply from decommissioned weapons is running down. A peer reviewed study, “based on an analysis of global deposit depletion profiles from past and present uranium mining, forecasts a global uranium mining peak of approximately 58 kilotonnes (kton) by 2015, declining gradually to 54 ktons by 2025, after which production would drop more steeply to at most 41 ktons around 2030.” – The Guardian. The study is “The End of Cheap Uranium” by Micheal Dittmar. Other studies I have read have indicated that this phase out of nuclear power would end about 2055 when uranium supplies will be substantially exhausted. Notions that we can get uranium from seawater, in a financially and energetically sustainable manner, are incorrect. It has been calculated that the amount of energy produced from the whole process would scarcely be better than 1 for 1 (1 energy unit produced for each energy unit input). As the uranium would be collected via a membrane technology, it has been calculated that lowering, raising, transporting and processing these membranes (akin to giant close-weave nets) would require a fleet equal or larger than the world’s current fishing fleet with all the fuel implications of that. It simply is not feasible. Then there is the issue of nuclear safety and nuclear wastes. Neither of these issues has been solved satisfactorily to date. Need I mention Chernobyl and Fukushima? Breeder reactors, including thorium breeder are unproven/unsuccessful to date at the commercial level. Finally, nuclear power loses out on costs. Without massive subsidies, including the military nuclear program, nuclear power is not economic. A number of peer reviewed studies have shown this. Solar power and wind power are proving more economically feasible and do provide sufficient energy profit (Energy Return on Energy Invested or EROEI). A Stanford study has shown a solar and wind power build-out to supply all US power needs (not just stationary power needs) is physically feasible and will be economically viable. “Stanford University scientist Mark Jacobson has developed a 50-state roadmap for transforming the United States from dependence on fossil fuels to 100 percent renewable energy by 2050. He unveiled the plan at the annual meeting of the American Association for the Advancement of Science in Chicago.” – Stanford News. Of course, solving our energy crisis and (hopefully) ameliorating climate change in time are not our only challenges. Population stabilisation, fresh water supply and food security for all nations will be huge challenges, and limiting factors, in their own right. Finally, it is clear that oligarchic and corporate capitalism cannot and will not solve these challenges. Capitalism reacts far too late to uncosted negative externalities. Indeed, capitalism is entirely reactionary and maladaptive when confronted by such challenges. By the time capitalism reacts, the environment is already irreparably wrecked. Only state directed dirgist action can mobilise our populations and resources in time deal with these challanges. In any time of existential crisis (e.g. the great wars) only state directed dirgist action has proved capable of the mass mobilisation and focused actions required. And make no mistake, we do face an existential crisis where the survival of civilisation and perhaps even of homo sapiens is on the line. I am aware of the sun’s energy input to the earth system. I did also say that even qualitative growth was theoretically limited on earth but for practical purposes it could continue for a very long time. I also pointed out that energy supply was not the only issue. (Fresh water supply is another issue.) Whilst the energy flow from insolation on earth is very large, the practical limits on collecting it (via solar and wind) will be reached before we harness anywhere near 100% of that flow. These practical limits will relate to material limits on the entire solar / wind infrastructure (from concrete to metals to so-called rare earths – neodymium etc.). These practical limits will also relate to environmental concerns. Whilst more benign than fossil fuel burning, a very large solar/wind build-out over large areas will affect local micro-climates and even possibly regional climates. We will have to be careful ultimately of these effects. What would be wrong ultimately with a steady-state, circular, recycling economy? Why is the impossible and unneccesary assumption made that civilisation must grow for ever? Knowledge and technology certainly could grow for a very long time (surely on the order of thousands of years at least). But population growth and gross built infrastructure growth must perforce cease. This will not mean ossification of civilisation or humans. Mankind will not lack challenges even in this advanced state. The planet will periodically suffer convulsions (possibly up to and including a super-volcano or major meteor strike not to mention new emergent diseases). We will never lack survival challenges. I’m pointing out that qualatative growth on Earth does not require an increase in energy input, so theoretically it can last as long as the Earth does. Energy and fresh water are interrelated — each can be used to supply the other. We will never reach limits on concrete or structural metals — the raw materials are just too abundant. Rare earth metals are more of a constraint, but they are available from different sources and alternatives do exist for most applications. Likewise with semiconductors. Too much solar infrastructure in one area could lead to cloudier afternoons there, but deserts are so big that that problem’s easily avoided. And is it really so bad if wind turbines make a few regions slightly less windy? What would be wrong ultimately with a steady-state, circular, recycling economy? Nothing if everyone has all the stuff they want. Everyhting if they don’t, for they’d lose the chance to get it. Human nature is dynamic, which doesn’t fit well with a steady state economy. But growth is likely to gradually become less important. Population growth must slow, but there’s no reason why it must actually cease. The same might eventually be said abut gross built infrastructure growth, though such a scenario is difficult to imagine. BTW there’s plenty of uranium available, but supply and demand forced the price down so much that it’s not economic to mine more. So you know more about uranium reserves than the peer reviewed science on the subject? Forgive me if I place more credence in peer reviewed science. Ultimately, any mined energy resource has to supply a positive EROEI (energy return on energy invested) otherwise it is ipso facto an energy sink not an energy resource. Modern mining and refining, including for uranium, is highly energy intensive. U238 is not useful for fission only U235 (of the U isotopes). Sure, breeder reactors can change all that but breeders are still not successful commerically. Ikonoclast, i suggest you visit the Brave New Climate website and read the latest article by John Morgan which has some interesting points to make on the EROIE of renewables vis a vis storage. I am not familiar with breeder reactors.However,nuclear fuel reprocessing is a viable and ongoing technology. The Integral Fast Reactor,which reprocesses its fuel on site,has been built as a prototype in the USA. Work on this reactor type was stopped by the Clinton administration for political reasons.IFR type reactors and Small Modular Reactors are in the process of advanced development in several other nations,including Japan. Generation 3 reactors are being built in many nations. This includes the Canadian CANDU. With reprocessing,waste is not a significant issue because of its small volume. Compare that with the waste from coal mining which will have to continue if the renewables madness is not brought up short. To my knowledge there is no shortage of uranium. Australia alone has large reserves. Thorium,an alternative nuclear fuel,exists in even larger quantities. Re cost, if you care to compare the all in costs of renewables with the all in cost of nuclear you will find that nuclear is more than competitive.In fact,with mass production in a factory setting of modular reactors,nuclear is competitive with coal and gas. When you mention Chernobyl and Fukishima you betray your abject bias. Chernobyl was an unshielded military reactor which succumbed to unauthorised experimentation by some of its staff. This type of reactor is still operating safely in multiple locations in the nations of the ex USSR. Fukishima was the result of a magnitude 9 earthquake. When this quake struck, all 4 reactors at Fukishima shut down automatically which is what they were designed to do. The reactors suffered only minor damage. One worker fell off a crane in the spent fuel area of one reactor and was killed. The tsunami resulting from the quake topped the tsunami walls at the reactors and knocked out the emergency diesel generators which had been sited too low – poor design. Because the grid had been rendered inoperative by the quake there was no electric power to drive the pumps which supplied cooling water to the shut down reactors. That is where the major problems started. In spite of that not one person has died at Fukishima because of radiation – not one. Many thousands died as a result of the quake and the tsunami.Many more thousands have suffered because of the silly reaction of the Japanese government in evacuating areas which were not at risk.Many thousands have also suffered because of the over reaction of the Japanese in shutting down their other nuclear plants.Their imports of fossil fuel have increased by orders of magnitude. Japan will have to return to and increase their reliance on nuclear.It is a TINA situation for them unless they are prepared to return to an early 19th century economy. With their population level that is not going to happen. When you,and others who are ideological cripples re nuclear,start chanting Chernobyl,Fukishima,waste disposal etc etc ad nauseum, I know that you are dangerously ignorant and destructive. I Know more about uranium reserves than your interpretation of the findings of one peer reviewed study, though I’m sure peer reviewed science has more information about it than I know or ever will. But living in a state where the expansion of a uranium mine on an unprecedented scale has been put on hold for purely commercial reasons, I can assure you you have cause and effect reversed. Uranium mining declined because the stockpile from decommissioned nuclear weapons was being used up. The energy return frm uranium is so enormous that the energy invested is of little significance despite the processes being highly energy intensive. And although you’re right about U238, you’re wrong in stating that only U235 is useful for fission. U233 is as well. Energy be it Primary or in the form of secondary goods is then directed towards London and its increased population. Given the distance from production the real cost of such scarcity operations is gigantic. How is this very much different from the UK war economy where the worlds refined oil was directed towards this large aircraft carrier – reaching a peak in 1944 (after a 1942 hiccup) , depression followed (through of 53) , only recovering in the mid 60s. The existing grid is not cut out for this kind of load. That’s nonsense. I worked for years for an electric power company in the 80s when this sort of thing was first coming out, and these hook-ups were quite routine technologically, and we had full and automatic bill/credit support for these kinds of accounts. They were perhaps an annoyance because they were few in those days, but no one was particularly upset about them. As for the future being nuclear, as Japan has well demonstrated, that is insane. In such a future, those power plants will be keeping the lights on only for the cockroaches. Benedict@Large,as the owner of a 5.4 Kw solar PV system which feeds into the grid I could tell you a few stories about the problems with this arrangement on the grid side. But the real issue is that no matter how many small private generators are installed they will not reduce carbon emissions to any significant degree. This is because they are an intermittent and unreliable source of electricity.Coal fired generators must be kept spinning as they can’t load follow to the extent necessary. Gas can load follow better but it is still a carbon emitter and an even more finite source than coal. As for Japanese, they will build more nuclear plants in better locations and with more advanced technology once the Fukishima hysteria dies down. They Have No Alternative. Btw, a thank you to Bill for getting my original reply to Ikonoclast back up.I don’t feel quite so pissed off now. There will be no nuclear renaissance. The physics and economics of reality precludes it. (1.) Uranium reserves are limited and peak uranium extraction has already occurred (1980). A new peak is just possible but not very likely. Extraction will decline rapidly after that. (2) Breeder reactors are still unproven for commercial use. (3) Nuclear power without all its subsidies is much more expensive than renewable althernatives. (4) Nuclear power is too dangerous. The dozens of reactor accidents show this. (5) The nuclear waste problem is still unsolved. (6) Nuclear engineering is much more difficult and dangerous than the engineering for renewables. The one form of nuclear power I do agree with utilising is that big fusion reactor in the sky… called the sun. Yes, by all means let us use that nuclear power! “One of the nuclear industry tactics is to make wild claims about the safety and performance of ‘new generation’ reactors like Thorium reactors. It is impossible to prove or disprove these claims, since the new reactors exist only as designs on paper. One cynic from within the nuclear industry has quipped that “the paper-moderated, ink-cooled reactor is the safest of all.”” – Friends of the Earth, Australia. (1) seems like you are really cherry-picking on this one. there are various different studies on this and you happen to pick out the worse case. fuel costs make up a fraction of the overall costs and operation would still be feasible with extraction from seawater. (2) commercial scale breeder reactors have been operating successfully since the early 70s. yes, solar panels are cheap when you import them from china but in terms of overall resources usage (concrete /steel/rare earths/land) nuclear is more compact than wind/solar per MW of electricity produced. (4) nuclear power still has the best safety record per MW of all methods of power generation, even if you factor in the most conservative estimates for people that will die from the after effects of chernobyl/fukushima. ‘new generation reactors’ like thorium reactors do not just exist on paper, they have been successfully implemented as test reactors. This seems to be a favourite lie of the Murdoch Press. They used it in the Adelaide Advertiser to “explain” why the wind turbines our state was installing would not generate electricity as cheaply as fossil fuels… even though the experts said (and events have subsequently proved) that we don’t need to keep coal fired generators on hot standby at all. They also tried to imply it in The Australian, with a front page story about Victoria’s wind turbines having failed to reduce their brown coal use at all, omitting to mention that this was because the extra electricity was exported to NSW. • Demand side balancing (some large industrial users can already adjust the timing of their electricity use, and with better information available the opportunity to profit from this could extend to domestic users). In the best locations that’s true, but once those are occupied additional renewable infrastructure may not be so competitive. It really depends on supply (how sunny it is, how wet and mountainous, how windy and how accessible hot rocks are) and demand (which depends on population density and the amount of heavy industry). It’s almost certain to be true in Australia and New Zealand but false in England and Japan.